SB 2790 Con-D-Soil is a highly effective non-acidic cleaner for all concrete and many masonry surfaces. SB 2790 can be successful in the removal of light to moderate soiling, biological fouling, most grease and oil deposits, rubber heel marks, some oxidation stains and certain other surface deposits. It is highly effective in cleaning of commercial tile and grout. SB 2790 is recommended for the removal of all form releases and powdered release agents on stamped concrete before sealing. 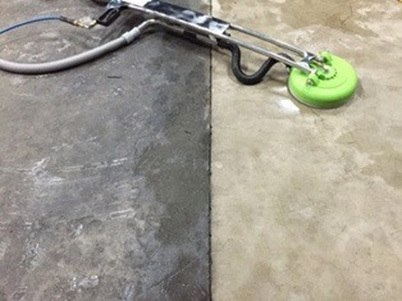 This product should also be used to clean existing slabs before apply a penetrating or film forming treatment or sealer. SB 2790 is an excellent general purpose cleaner and can be used to clean most painted surfaces, vinyl and aluminum siding, decks and vehicles. Provide protection for foliage, pedestrian and vehicle traffic. Test all non-masonry surfaces for possible adverse reactions. Protect all surfaces and situations where damage may result from spillage or material drift. All projects should start with a test application to determine cleaner suitability, dilution ratio and acceptable method for application. Test areas of at least 10 square feet are recommended and should involve the most severely contaminated area. Final determination of product acceptance should not be made until the test area has become dry. Dilution: 1 to 5 parts water to 1 part product — test application recommended. See Other Product Uses below. SB2790 Con-D-Soil is most effective when applied by low- pressure spray. Brush application and agitation may prove helpful on some surfaces. Dwell times are from 5 to 30 minutes. Do not let the cleaner dry on surfaces; mist with water or diluted cleaner to keep the surfaces wet. Removal of the cleaner and contaminant can be accomplished most successfully with pressure washing equipment. If only garden hose rinsing is available, light scrubbing or brooming during rinsing may be required. A thorough rinsing is required. Dilutions are 0 to 5 parts water.SB2790 Con-D-Soil is for use by professional contractors only. Projects where complete rinsing cannot be accomplished will require an additional neutralization step. Do not use on bright aluminum, metalized glass, “self cleaning” glass or fine wood surfaces.